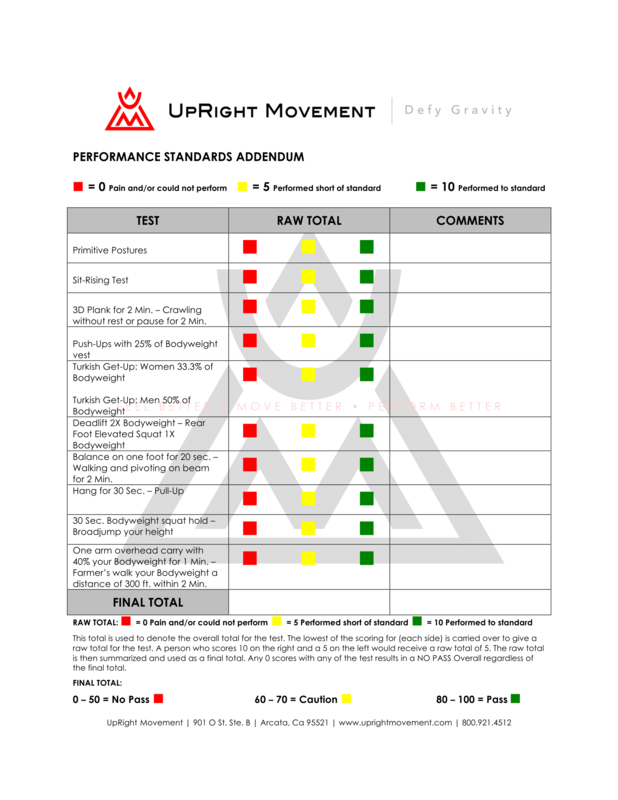 UpRight Movement’s seven physical PERFORMANCE standards are a series of accurate, reality-based movement tests designed to determine the functional ability of your body. Each test demonstrates your ability to perform the movements (both Fitness and Performance) necessary to move through your life without being vulnerable to injury. If any of these movements are difficult or not currently possible, we are able to develop specific routines that help you to safely restore, balanced movement patterns. 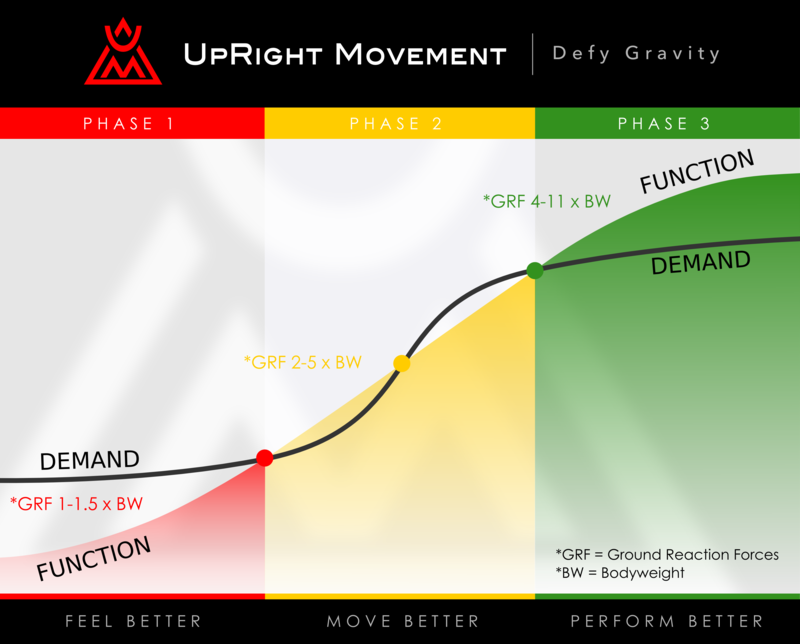 UpRight Movement redefines fitness as the ability to consistently thrive and function within the demands of your environment. The Lunge pattern essentially is a freeze frame picture within upright locomotion, (walking, jogging, running and sprinting). Essentially this is one qualifier to running. The trunk stability within the push-up is one example of one’s reflexive ability to stabilize the spine while performing a total body movement, which is inclusive with the shoulders, trunk and hips while resisting gravity’s extension force on the body. Essentially this is one qualifier to upright total body pushing movements. The squat pattern within the air bench is one example of lower body strength that is essential to standing. Essentially this is one qualifier of the upright function of the hips, knees and ankles. The shoulder mobility within the chin-up is one example upper body mobility and strength. Essentially this is one qualifier to upper body overhead pulling and pushing movements. The trunk stability within the rear delt hold is one example of one’s reflexive ability to stabilize the spine while performing a total body movement, which is inclusive with the shoulders, trunk and hips while resisting gravity’s flexion force on the body. Essentially this is one qualifier to upright total body pulling movements. The shoulder mobility and trunk stability within the static supported handstand is one example of one’s reflexive ability to stabilize the spine while performing a total body movement, which is inclusive with the shoulders, trunk and hips while resisting gravity’s compressive force on the body. Essentially this is one qualifier to upright total body overhead pushing movements. 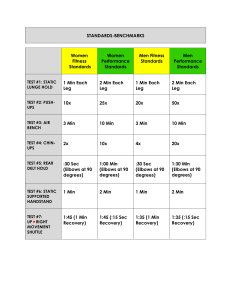 The emphasis within this test confirms our functional ability to perform within our body’s primary movement blueprint and signature under the demand challenges of; strength, muscular endurance, respiratory endurance, coordination, and balance. Essentially this is one qualifier to upright total body function. 3D Plank for 2 Min. – Crawling without rest or pause for 2 Min. Balance on one foot for 20 Sec. – Walking and pivoting on beam for 2 Min. One arm overhead carry with 40% your bodyweight for 1 Min. – Farmer’s walk your bodyweight a distance of 300 ft. within 2 Min. 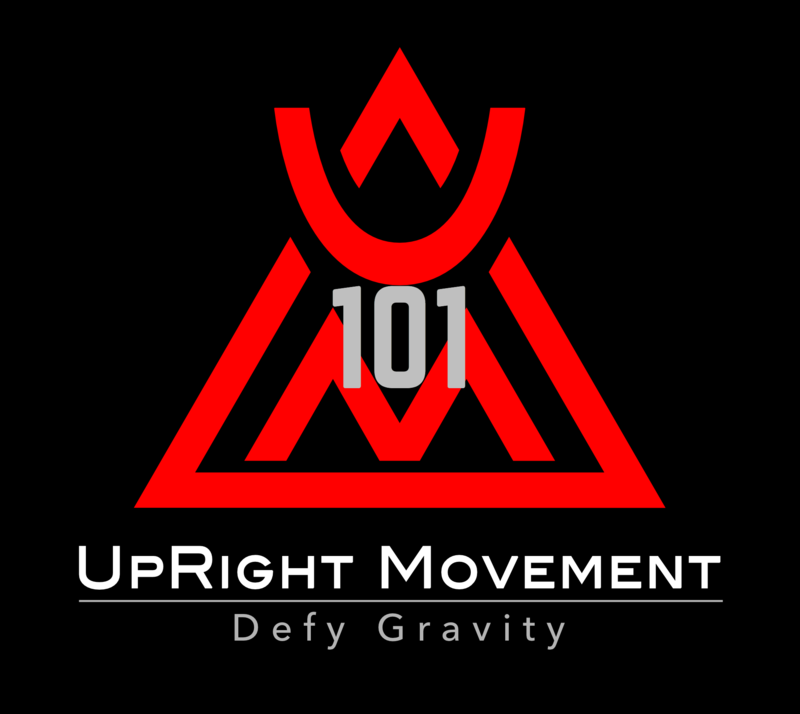 UpRight Movement is a Force Multiplier here to help You Defy Gravity!